This week is #iwill week, where we celebrate the achievements of young people taking part in social action. 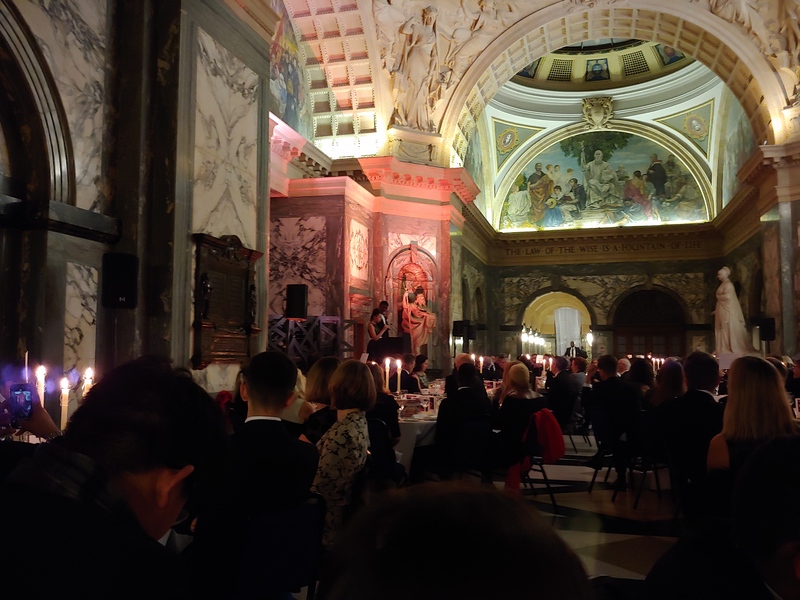 That’s why we were so pleased to have two of our young people invited to speak at the City Bridge Trust Chairman’s Dinner last Thursday. Maya and Curtis spoke about the power of our youth action and leadership programmes and good youth work. 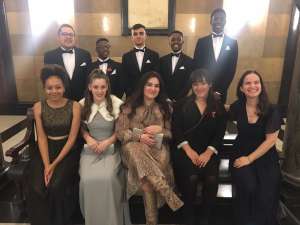 Curtis and Maya are both members of Dare London, our youth advisory board, and have been involved with City Leaders, our youth action programme which is funded by City Bridge Trust. Good evening ladies and gentlemen. My name is Curtis, I attend Activities4U youth club, I’m a member of Dare London, and I was on London Youth’s City Leaders programme in 2016/2017. I’d like to speak to you, if you will permit me, about my personal journey through working with London Youth. I want to help you understand how important youth work is in such a special, unique, culturally diverse and opportunity-abundant city called London. I started my journey with London Youth at home with my family by being given, by mother, a strange and long-winded application form which asked me some questions about myself in preparation for a mysterious pitch. I filled out the application form reluctantly. I now know that my youth club Activities4U was asking me to join London Youth’s City Leaders programme. I went to the session with a push from my parents although I was initially apprehensive of the situation. However, unexpectedly, I learnt a lot about how to work under pressure and how to show leadership despite what I’d already learned through being involved with Activities4U. I then continued with the programme from there and successfully gained £1000 to fund club and community projects! I then took to the next stage of the City Leaders programme – with another dreaded application form! I learnt more about myself and how to work efficiently in everything I do. During the Future City Leaders programme, I took part in amazing masterclasses and gained a Youth Leadership Accreditation on a memorable residential. With what I learned on City Leaders, I then became a member of London Youth’s Dare London Youth Advisory Board – meaning another scary application form had to be signed! I am now in my second year with Dare London and I am honoured to be on it having meaningful sessions, thrilling residentials and wonderful opportunities. Dare London has allowed me to push myself through hard work, networking and making new friends with new people and gaining independence. I have also developed other hard-to-obtain skills like confidence, resilience and patience. Personally, I feel that opportunities like these through youth organisations are vital in helping a young person grow. They are massively important and need to exist. Youth organisations have made me the person who I am today. I simply could not have had the same motivation to make a difference I have today without key people. They have believed in me and pushed me to take one step further each stage of my journey with London Youth. That is why finding out a devastating 62% of youth service funding was cut over 8 years in London between 2008 and 2016 saddens me to the core. Equally of importance, a further 1.2 million was expected to be cut from youth services in 15 councils in the 2018/19 year according to Siân Berry’s ‘London’s Lost Youth Services‘ research report. Upon using this evidence, I can now start to understand why a terrible and ‘ghastly’ knife crime epidemic is surfacing in London. 83% of youth workers themselves believe that cuts from youth services have an effect on crime and antisocial behaviour. With a decrease in youth services in London and around the country a knife crime epidemic starts to surface. Just last week, two young men in South London were stabbed to death. Although some may beg to differ, I believe the two major things happening in London and around the country may be linked. I believe that these two problems occurring in London and around the country need to be solved and one cannot be solved without the other being solved. That is where, I believe, important individuals like you fit in. Funding, support, strong young people to be ambassadors for youth services are needed greatly. Therefore, with utmost sincerity, I beg all of those in the room to do what you can to support young people. As a person who has been affected by knife crime, seeing friends or people close to me lost in an instant, I believe that your contribution could save a generation. I believe that knife crime is growing at a scary, exponential rate. I fear the people that knife crime affect may get closer and closer to me. A future with knife crime being rife in London is a future I want to avoid. Youth organisations are a key part of the solution. I hope people like you can start to make a change. Many thanks for your time and your ear. Good evening, my name is Maya and I am 15 years old. I have been asked to speak at the start of this dinner to set the scene for this evening. I go to Coin Street youth club, I’m a member of Dare London, London Youth’s youth advisory board, and last year and this year I was involved with London Youth’s City Leaders programme, which is funded by City Bridge Trust. I want to tell you what I got from participating in City Leaders and with youth organisations. At school I am used to not being noticed and often blending in with the crowds. I have struggled with friendships and that has often left me unhappy and lacking in confidence. For a long time, I didn’t know why I was finding social climates at school so hard but then I was diagnosed with autism. However throughout all of this I was able to find my place in youth organisations like Coin Street. I started at girls club when I was twelve. Although I didn’t find it necessarily easy to make friends, I felt accepted by the girls and the youth leaders. At Coin Street, I was able to attend many theatre trips, cooking courses, and have many talented visitors come and share their skills. When we took part in the City Leaders programme with London Youth we had to use many skills such as pitching and team building. Through the final project where we had to present a pitch about our communal idea in front of a row of judges it was noticed by many others that I had a talent in advertising and pitching. The last stage of the City Leaders programme was the community group stage. In our group, we decide to do an entrepreneurship project selling t-shirts on a stall. This was a great opportunity for me as it was a great chance for me to work and sell to customers. We also got to experience the whole process of selling t-shirts as we designed the t-shirts made them and sold them. One thing I got out of this was the confidence to talk to members of the public and broadcast our community project and youth club to many others. From this I was able to take part in the Future City Leaders campaigning course with London Youth over the summer. On this course I was able to make many friends because I was in a comfortable atmosphere to do so. Through my time at London Youth I have been able to overcome many challenges and face new ones too. As a result of taking part in City Leaders, I had the confidence to join Dare London. One of my most recent memories of this would have to be on the free residential that London Youth offer for everyone on the Dare London when we got an activity called the Jacob’s Ladder. Let me explain this. In groups, we had to get to the top of these logs of wood attached by wire. But, as you get higher, it gets harder because the pieces of wood space out. It gets too hard for anyone to get up by themselves and so the idea is that you have to help each other up. This was a real accomplishment for me. Some of my closest friends on the course, Jesse and Shakira, and I were able to get up all the way to the top. We got there through teamwork, trust, resilience and commitment. Moments like these are crucial for young people as they give you a feeling of accomplishment outside the classroom that no one can take away from you. What is really good is that London Youth and other youth organisations offer opportunities like this and often for free. One thing that is becoming a more frequent topic of conversation is young people’s mental health. This plays a huge part in young people’s approach to life. It is really important that there is provision put in place for teens so that there is somewhere for them to feel supported and cared for. It would be really helpful if you could help. We need more projects about how to have good mental health and training for leaders so they know how to approach us when having normal conversations about how we are. Through having more provision like this I feel that if a young person is going through a tough time there is a safe space for them to feel comfortable and open to talking about it. This will allow them to get the help they need. This would also help open more youth organisations as places that offer provision for young people looking for help. I think that if I had opportunities like this at a younger age my journey would have been easier and could have been supported better. However, my experiences have helped to make me who I am today and I wouldn’t change a thing because it has built my personality, taught me perseverance, resilience and awareness of those around me who may be having similar difficulties. But it is important that we can help these young people to have an easier journey than me and help shape them into the young adults of tomorrow. Stay up-to-date with all the latest news, blogs and policy updates from London Youth here. Join the conversation on Twitter @LondonYouth and on Instagram @London_Youth. We are very grateful to City Bridge Trust – as well as Morrisons Foundation and CVC Capital Partners – for their generous funding which enables young people like Curtis and Maya to take part in City Leaders.